Background: The Wnt signaling is one of the crucial pathways in embryonic development and numerous types of human cancers. Porcupine, as well as the Wnt protein palmitoyltransferase, is essential to the regulation of the Wnt signaling pathway. The aims of this paper are to we use the three-dimensional quantitative structure-activity relationship (3D-QSAR) models to gain indepth comprehension into the structural requirements of PPN inhibitors. Meanwhile, we utilize the 3D-QSAR models to predict the PPN inhibitory activities of new tricyclic derivatives and further design high-efficiency and potential PPN inhibitors. Methods: Using Comparative Molecular Field Analysis (CoMFA) and Comparative Molecular Similarity Indices Analysis (CoMSIA) approaches implemented in the SYBYL-X 2.0 software packages in the present study. Results: The statistical results obtained from CoMFA and CoMSIA models were full of credibility and remarkable predictive power. 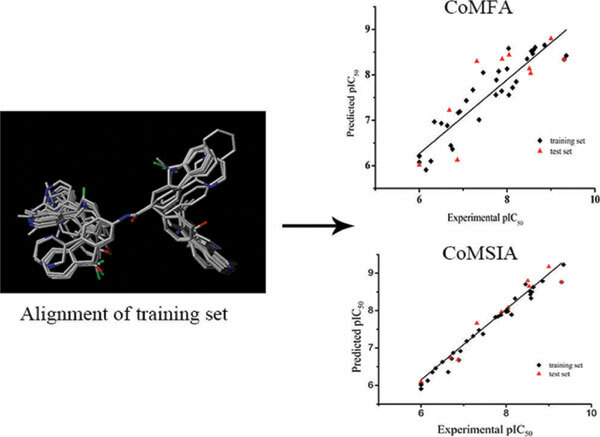 Conclusion: In this study, CoMFA and CoMSIA models were developed for a series of tricyclic compounds as Porcupine Inhibitors for Wnt pathway production inhibitory activity. All of these models possessed good internal predictivity. These 3D-QSAR models for tricyclic compounds gain insights into the relationship of various structural attributes for the biological activity. The calculation of the data computed from the present study can be used to predict the PPN inhibitory activities of new tricyclic derivatives and further design high-efficiency and potential PPN inhibitors. 3D-QSAR, CoMFA, CoMSIA, Wnt pathway, porcupine inhibitor, tricyclic derivatives.